For goats curd topping, mix goats curd, walnuts, celery and chives. Spread 4 slices of bread with goats curd mix. Cut into quarters and sprinkle with watercress on top. 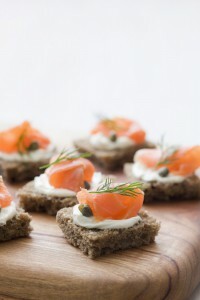 Ocean Trout: spread cream cheese over 4 slices of bread. Top with ocean trout strips, baby capers and chives. Recipe and image kindly provided by George Weston Foods.